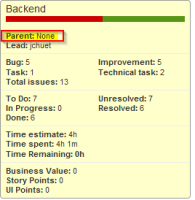 [JRACLOUD-846] Support for subcomponents - Create and track feature requests for Atlassian products. While we absolutely understand many the logic behind many of the requests for subcomponents, we strongly believe that our focus should be on making JIRA simpler and easier to use. Simply put, additional levels of hierarchy for components is likely to add complexity on a conceptual level, at a technical level (more bugs and slower performance) and will lead to a more confusing UI. JSWCLOUD-5351 Option for Component View / Project Components to be pulled from a cascading select custom field.